The following story was written by Richard VanderHeide. I met Richard at one of the national Shelby conventions. I really enjoyed meeting him and looking at his beautiful car. When I was in high school (let’s just say the mid 70’s), I was bitten by the Shelby bug. At age 16, I found out about Shelby’s from reading car magazines (i.e. Road and Track, Car and Driver) that my father left laying around the house. To increased my knowledge, I joined the Shelby American Automobile Club because “ownership isn’t necessary; only enthusiasm”. The going price of GT350’s at that time was around $4,000-$7,000; clearly too rich for my blood. The one true Shelby I saw was a 1965 GT350 that was parked in the executive parking lot at Steelcase Furniture Company in Grand Rapids, Michigan. I left a note on the windshield professing my unrequited love for the car. The owner graciously called me back and offered me a ride in the car mentioning that the car was great because “it hadn’t been driven hard or destroyed by teenagers like a lot of the other cars”. Well, needless to say I made up a lame excuse why I couldn’t meet him for a ride since I was 16 years old. Fast forward to 2003. I am now grown up and the proud owner an original 1964 Pontiac GTO tripower/4speed convertible (still own the car). I had some extra money and was thinking about buying another GTO. Then, I thought I wonder if I can afford a Shelby? To make a long story short, I ended up finding a car on the internet that was billed as unrestored. Well, I love the concept of unrestored and original cars so I contacted the owner/dealer in Arizona. He did not know much about Shelby’s at all except that he was certain he could make money on the car. But, he was smart enough to have a local Shelby expert look over and appraise the car. I talked with the Shelby expert who assured me that #2375 was a completely unrestored, 49,000 mile car original even down to the exhaust system! Well, I was amazed and quickly bought a Shelby Guide and confirmed that the car was originally delivered to Courtesy Motors in Littleton, Colorado. Little if anything else was known about the car’s history until it showed up at the dealer in Arizona so I assume the car spent a long time in a barn somewhere in Colorado since it showed no rust and many peculiar dings consistent with storage damage. After bringing the car to Michigan in fall, 2003, the car attracted immediate attention (as all Shelby’s do!) as it was being loaded off the trailer. I took the car for it’s maiden voyage with my 16-year-old son (does the age ring a bell?). In an attempt to impress him, of course we got on the car at the first stop light out of sight of the local police. Unfortunately, the car sputtered and stopped after one short run. The problem? The carburetor had sucked a bunch of rust from the gas tank no doubt due to the long storage period. The car spent the rest of that fall getting the tank dipped and the carburetor rebuilt and then she was stored for the winter. SAAC-29 was in Michigan at the Michigan International Speedway on the first weekend of July 2004. I was anxious to get my car judged in the unrestored class and managed to be the first person registered for concours judging in the late Fall of 2003 (hey I said I was anxious). I drove the car to MIS (80 miles each way from my house) for the show. I met many interesting, knowledgeable people at the show but no one more so than the host of this web site; Pete Disher. Pete took me under his wing and showed me many things about my car that I did not know. Pete is very gracious and patient and still answers my questions today. The judges must have also liked the car as the car was awarded a Chairman’s Award for outstanding example of an unrestored, original car. If you could have seen the other cars that received this award, you would understand how amazed and proud I am of this award. In late February of 2005, I was contacted by Jeff Burgy, the founder of the Detroit Chapter of SAAC, who wondered if I would be interested in letting Ford use my car for “an important public relations event”. I said sure but I was curious as to the nature of the event. He told me that he wasn’t able to tell me everything but it involved a new Shelby and Carroll himself was going to be at the event. Well, I immediately said yes and started making arrangements to have the car taken out of storage and transported to SVT in Dearborn, Michigan. 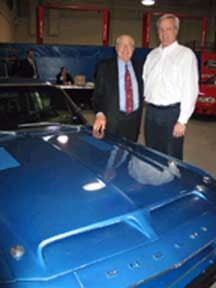 On March 17, I was allowed to visit SVT headquarters to meet Carroll Shelby and see the soon-to-be unveiled Shelby GT-500. I can’t tell you what a thrill it was to meet Mr. Shelby. He was very gracious and took time to talk to me about my car as well as allow me to have my picture taken with him in front of my car as well as the new Shelby GT-500. And, oh yah, he signed the dash of #2375 before I left. Over the past two months, I have seen my car in numerous national magazines that have picture spreads on the new Shelby. I am sure that my family is sick of me buying magazines and saying, hey! look! that is my car! We know, Dad, we know. 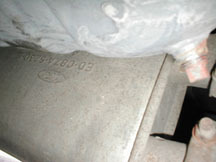 Well, that is the story of #2375 to date and why you see the picture of Carroll, me and 2375 on Pete’s website. I love the car and plan to enjoy it for years to come. I don’t plan on restoring the car; after all, they are only original once. By the way, my son is now 17 and wants to know when he can drive it. I told him I don’t know but sometime soon. You remember those teenagers who drive Shelby’s hard and destroy them? I do….